These wonderful cheesecake pops are perfect for any party! Change the color of the sprinkles to match your party theme. Finely crumble cookies with your hands in a medium sized bowl. Add cream cheese, vanilla extract, and granulated sugar. Mix well and form 1 ounce balls. 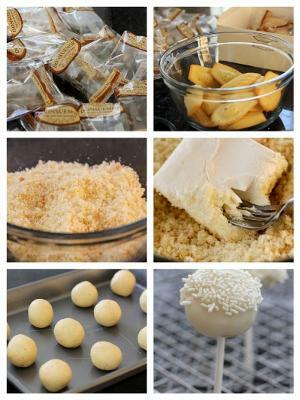 Place cheesecake balls on a small tray and transfer to the freezer for 15-20 minutes. While cheesecake balls are chilling prepare the white chocolate ganache. Pour white chocolate chips into a small bowl and place over a double broiler over low heat. Stir until melted. Remove double broiler from the stove and place over a heat-safe surface. 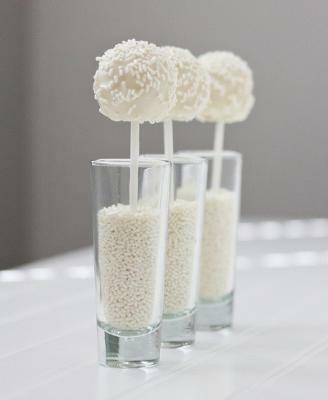 Remove a few cheesecake balls from the freezer at a time and place a lollipop stick into each one. Dip pops one at a time into the melted chocolate, gently shake to remove any excess chocolate and dip into jimmies. Repeat until all cheesecake pops have been coated. Transfer to the fridge until ready to serve. We give special thanks to Josie for allowing us the use of her photos and recipe. See her site for other wonderful desserts! Join in and write your own page! It's easy to do. How? Simply click here to return to Desserts and Party Food Ideas.